Do you love to create “Mosaic” mashup of multiple photos? 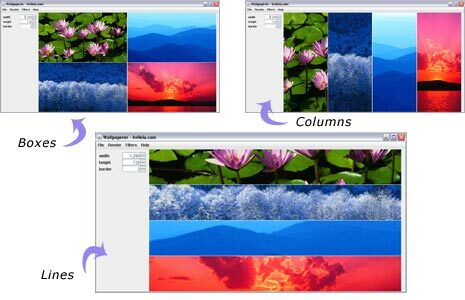 Wallpaperer is a dead simple portable program to create Mosaic wallpaper photos on the fly. Just drag the photos in the application windows and your Mosaic image is all ready. Besides original colors, it supports different color tones like sepia and black and white. 1. Download Wallpaperer program (java based application). 2. Double click downloaded file to launch program (no install required). 3. Drag and drop images to the application window. 4. Set width, height and border for final Mosaic wallpaper. 5. Chose different type of Mosaic, goto Render and select either of boxes, lines and columns. 6. Goto File > Export to save your Mosaic creation on the computer. coolmosaic.com is free, fast,high quality and easy to use. thank you so much this was extremely helpful! !